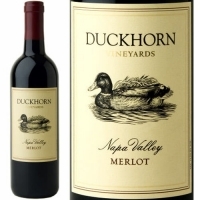 Showing a subtle floral note and spice on the nose, the 2015 Napa Valley Merlot from Duckhorn, its most basic Merlot, is inviting and delicious from start to finish. This vintage offers a complex palate of juicy red and black fruits, exceptional balance and a long finish. The growing season yielded a classic expression of Napa Valley Merlot, with a fleshy entry and juicy layers of Bing cherry, raspberry and plum, along with hints of blueberry, cedar, vanilla and clove. Underscored by polished tannins, the juiciness of the entry evolves into a lush, silky texture that carries the flavors to a long, generous finish marked by notes of freshly ground coffee beans with a splash of ripe, red cherry.